There was no magic and an excess of reality in the gruesome display by Argentina on the football field of Niznhy Novgorod against Croatia on Thursday night. Following a month of media hype that spread from Argentina to Russia, the Messi brand was hyped up while the man on the pitch remained as small, introverted and enigmatic as ever. If the first match against Iceland had left one gasping for air, a solitary point with a new burden for Lionel Messi to live with (the failed penalty), the second act saw him reduced even further. The shadow of Maradona may be a contributing factor to the tiny genius’ mental block when it comes to the national team, but he wasn’t even able to be a shadow of himself on the night they most needed to recover. This chronicle of death had been foretold. Most of the criticism levelled at Leo echoed what has been maintained before — only further weight lent to their arguments by the 90-minute-long meltdown. But even staunch Messi defenders appeared lost for words. Many who have been saying for a few years now that they support Messi rather than Argentina, simply reiterated that their now infinite, deep sorrow, was also more for Messi than for Argentina. He’s depressed, some argued, while others bellowed, some on national TV, that they’re sick and tired of hearing that he is depressed. That the kid’s not up to the task of being the Nation’s Number Ten; that it’s time to put a stop to all the a**e-licking (sic) and allowing him to call the shots when he’s clearly unable or unwilling to do so. Sampaoli himself tried to throw some damp cloth around at the post-match conference, blaming himself and his system. 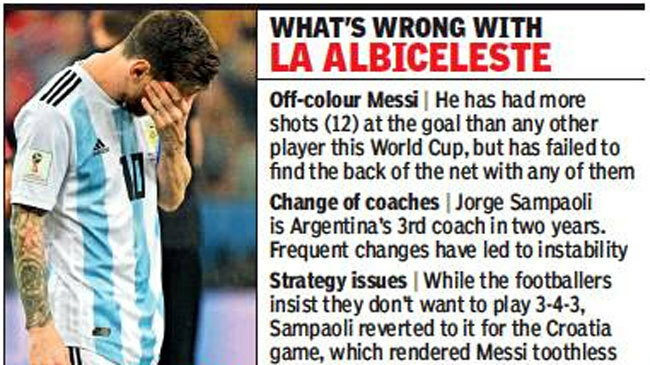 So the triad of culprits in the eyes of the public was confirmed: Caballero’s mistake seemed a laughable anecdote in light of the annulled Messi, and both are guilty of obeying Sampaoli’s chaotic non-plan, in turn making the manager a national disgrace. The sorry sight of a broken team dragging themselves aimlessly around the pitch rendered what might have been a comical defence totally humourless. It was in a shambles, and whereas defeat could be regarded as an unavoidable professional hazard of football matches, this was worse than defeat. This was rendition. This chronicle had been foretold. For a number of years, football in Argentina has all but collapsed institutionally, politically, and in a sporting sense. Sampaoli arrived to steer a sinking ship, faced with a group of players who were at the end of their tether, quite literally, having lost three major finals in a row and labelled as losers. Angel Di Maria confessed he needed therapy, Higuáin repeatedly mentioned that he scored 300 goals and was forever stuck to the one he missed, Aguero told the press that those comments hurt. And this, when they were struggling to qualify for the World Cup. The disaster is by no way definitive and a third Act will follow, with a slim mathematical chance of going past the group stage. But it’s almost as if the supportive thing to do at this stage is wish them all to be spared any further agony. Especially Messi. He never wanted this. And he certainly doesn’t deserve it. Nobody does.